Ulearn11 has come and gone. 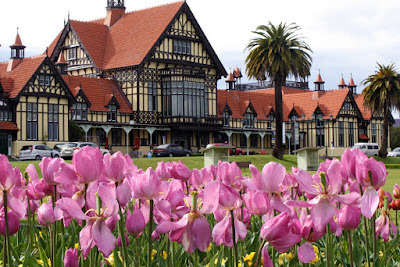 This year it was in Rotorua as the venue we normally use is in the red zone of Christchurch. The conference was a huge success as always and everyone I spoke to went away buzzing. My job is to shoot video for the duration of the conference. I captured 35 videos over four days. You will be able to see them on the EDtalks website very shortly. This photo is the Rotorua Museum which is right next door to the convention centre. It is a beautiful building, and the flower gardens on the walk in to work in the mornings were just glorious!